High pressure angle valves with split body. Connections manufactured to IG standards. Other high pressure screwed connections or flanges are possible. These valves provide a basis for high pressure relief special designs e.g. with wear bushes, dissipater Valves with pressure classes above PN40 or ANSI Class 300 are considered by Flowserve as “high pressure” designs. 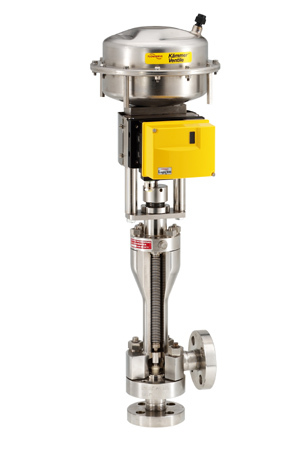 Based on decades of proven experience and expertise, Flowserve can supply the best high-pressure control valves on the market with pressure classes up to PN4000 / ANSI Class 4500 and above. High pressure angle valves with split body series 011000/015000. Connections manufactured to IG standards. Other high pressure screwed connections or flanges are possible. These valves provide a basis for high pressure relief special designs e.g. with wear bushes, dissipater sleeves, additional downstream plates. Furthermore, due to their unique construction, they can be manufactured from almost any desired material.